Congrats to Ryan Dickerson! You are the winner of the April giveaway. Big thanks to CLIF BAR for supplying the swag. Thanks to all who entered. What a race it was! Ryan, email me at yogrunny@gmail.com. If you are local I will leave the swag at The Bike Route. If you aren't local I will mail it to you. Would you be scared if you saw Luca in a dark alley? Yup, a little. One day, one race, for all the marbles...well...until the following weekend. I love the one day classics! One of cycling's Super Bowls the Ronde van Vlaanderen (Tour of Flanders) is this Sunday April 6th. I am so fired up! All of my favorites are coming into the 101st edition of this race in good health and at top speed. 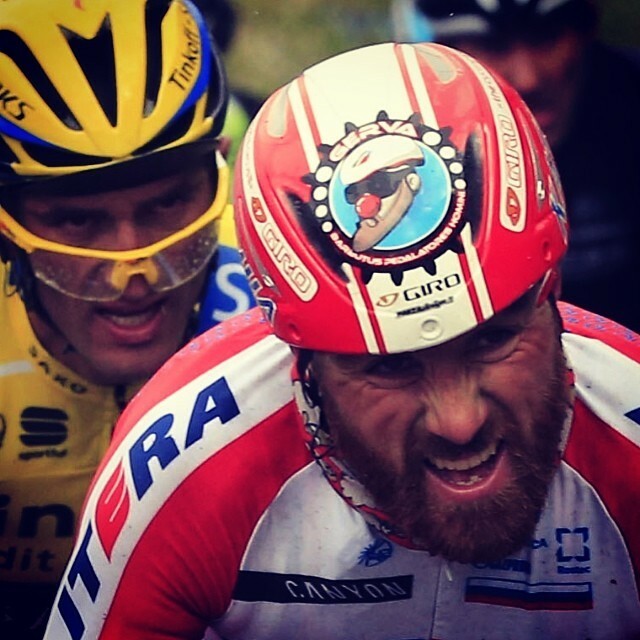 I can't wait to see Tomke, Spartacus & Peter I hit the brakes & still won Sagan leave it all on the road. Without further adieu. Tell me who your favorite is and your dark horse pick. Leave a comment below to enter and win! A little care package from CLIF BAR! Spartacus. Because he is Spartacus! Niki Terpstra - because for some reason I always pull for Dutch riders. SPARTACUS! He is the most fun to watch ride into victory with his 1 man style and power. Spartacus is my favorite, but it think Stybar takes it ahead of Sagan after Boonen/Spartacus cancel each other out. Fabian Cancellara because he's so euro classy, can make 1400 watts seated up the Murs, and says things like "on the end" instead of "in the end." Tom Boonen is going to find old form after snorting a few lines prior to the start. Cancellera is going strong. Dark horse...Taylor Phinney 'murica. Stybar, Terpstra, and Boonen isolate Spartacus and duke it out 3 vs. 1. Stybar slips away for the win before the velodrome. Hushovd, Phinney, and Sagan sprint it out for 5th. Now put all your money on that lineup at Unibet.com before Sunday. Spartacus. The other riders mentality is how to beat and attack Spartacus. No personality in their own. Dark horse is Terpstra. If he could be considered a dark horse. Have you seen a single race that Sagan was in where he didn't display some sick bike handling skills? He makes riding your bike look fun. but I've got a hunch that Devolder may steal it. I'd love to see Phinney there at the end. Jurgen rolends dark horse. I'm hoping the race is about survival of the fittest and not the team help crap. In the spirit of breaking away from the stated favorites, Sky's Boss Hogg. Favorite: Cancellara, dude is super strong and never out of position when the race jumps off. Darkhorse: Arnaud Demare, rode really well at DePanne and would be deadly out a small group. Boonen!!! My dark horse is Degenkolb's mustache for a follow up from last weekend. And now you know why choosing Spartacus needs no explanation. Holy cow. What a race! How many times will GVA finish on the podium but not the top step?